The British Riding Pony should possess a good, honest, attractive head with a bold, intelligent eye, well set on head and neck from the shoulder, with a good prominent riding wither. It should have a flat, sloping shoulder with good length of rein, deep heart room and well sprung ribs. There should be sufficient depth through the loin with enough scope to carry a saddle. 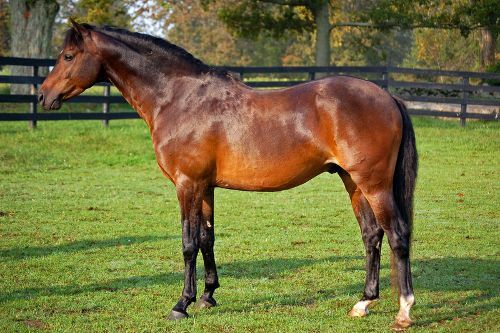 The quarters should have sufficient length with a well set on tail, with the hind leg correctly put on from the loin, giving a strong second thigh and a good strong, clean hock. The limbs should have sufficient quality bone to carry the body, with good broad knees, short flat canon bone and the fetlock joints should be large enough to stand hard work. Also, there should be a good open shape to the foot, the pasterns being the correct length and angled at roughly 45 degrees to the ground. A show pony should have elegance combined with movement, with pony type, quality bone and sufficient substance. The action should be true, straight and floating, covering the ground with effortless ease. If your enquiry is not urgent, you can contact us at the secretary's address or telephone number below.